Tattoo is a part of fashion and is something I see daily in the street. Some have very impressive designs that tempt me to have one myself. I see some Kanji characters on people´s body and often they are just "Kanji-looking" characters, which I don´t know whether I should tell them or not. Once I had a client and she had a Kanji "妹 (Imouto / younger sister)" on her shoulder. When I mentioned it, she was very happy that the character was actually readable. She explained to me that she has a elder brother whom she loves and that´s why she decided to tattoo "sister" as an honour to be the sister of him. Interesting. Japanese tattoos are often considered as arts and many westerners are fascinated about it. 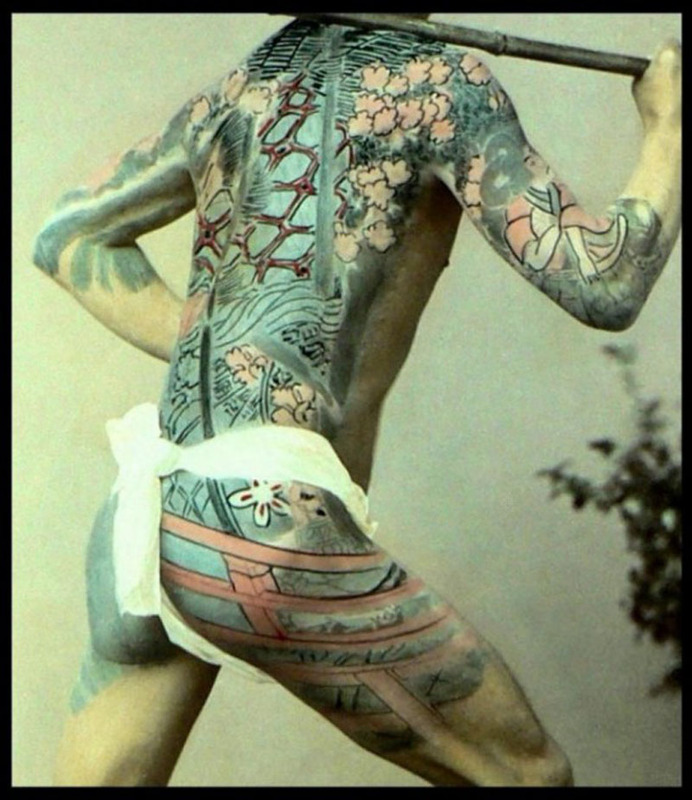 However in Japan despite of recent tattoo fashion boom, people still have a bad impression towards Irezumi (入れ墨). Why is that? Japan has a very old tattoo culture, probably since Jomon period (縄文時代/14,000BC-300BC) and the Japanese gorgeous tattoo that we now know was established in the middle of Edo period. At that time, many people came to big cities such as Edo (now Tokyo) and Osaka and with the population growth, the number of crime naturally increased. Irezumi was introduced as a punishment because of its character that it´s not easy to get rid of. From there, it spread among prostitutes, gamblers, construction workers and couriers as a fashion. The criminals were tattooed on their forehead so that people could see they committed a crime. 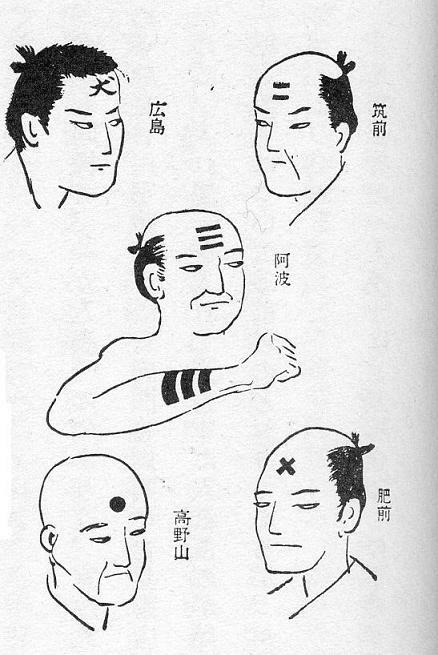 Also each region had it´s own symbol and by the Irezumi people could tell where those guys committed the crime. The most curious one is in Hiroshima. Each time someone committed a crime, they tattooed another line. What Hiroshima did was, this. The first time the criminal get one line across the forehead, the second time a line across the first line, a little curved towards left. The third time, they added another line on the right and a small dot on the right shoulder of the first line. This, some of you may realize it, is a character of dog (犬/ inu) in Japanese. I have no idea why they had chosen this character but certainly carrying the letter “dog” is embarrassing. 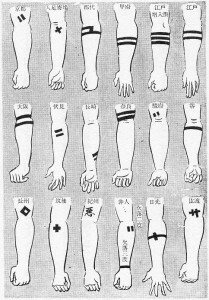 Other part of Japan gave them tattoo on the criminals´ arms. Many are simple lines around the arm. 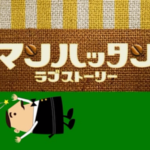 On the bottom line, the third left, I can see the sign of “悪”, bad in Japanese. This was Kishu´s (紀州/now Mie and Wakayama prefecture) tattoo. Very straight forward. Although later, tattoo became a symbol of fashion, toughness or showing love for someone, somewhere in the brain of Japanese people, unconsciously stayed this old custom about tattoo. 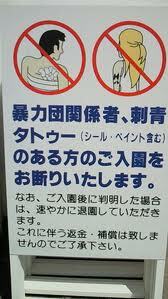 In fact, many public swimming pools, baths and Onsen (温泉/natural spa) don´t allow customers with a tattoo. This is because other customers may think that he or she is a criminal or a part of Yakuza family and get scared. This place, in the photo, doesn´t even allow stickers or painted tattoos. I imagine if a man with a tattoo like this comes in to a public bath, it´s a little shocking or worry-some but I don´t know if they react the same even though the tattoo is obviously the fashion one. Anyway you can see what Japanese people think about tattoo. I have some friends who are into tattoo and a few of them especially like Japanese tattoos. One Brazilian girl had once showed me a beautiful peony flower tattooed on her thigh. It took her two days to complete and she still had fever from it. I just worried, knowing that they really like Japan, they might be disappointed when they arrive at Japan and get refused at the entrance of Onsen, for example. I understand that for them having Japanese tattoos is not only a fashion but also a proud and an honour to Japan. But I don´t know how Japanese people consider. I like to know Japanese people´s opinions. What do you say? If you are interested in seeing different tattoo design, check Meaning of tattoo designs. Do your research. If you knew enough about tattooing you would be the benefits of it being hidden from the mainstream. I came across this article and i am really interested in the simple armband tattoos. Is it possible to ask the name of the book or source the image was extracted ? I don´t see any particular names for this. You can find more images by typing, “criminal tattoo in Edo period”, for example. I have been 3 times to Japan and I have 3 tattoes. I have never had problems getting into onsen. Nobody looked At me Just because we are gaikokujin. Hey, Juju (is thar correct? ), how are you? My name is Chris (actually, it’s Christiano, but Chris is my social [?] name =P), and I’m doing this interdisciplinar academic research about criminal identification (to obtain a Master degree in Criminologic and Forensic Sciences!!! =] ). My research led me to this nice post and I would love to know more about it. You know… To see any material you might have about this ancient method of criminal identification, the implications of it (both present and past) and – if your probably busy agenda allow you to – chat about it. But, what I wanted the most was to know your real name, so I could reference both this webpage and the authorship properly (giving YOU, the author, the credit for the obtainment and the writing of the material, cause, I couldn’t find but a nickname in the publication… Your name would be more suitable). 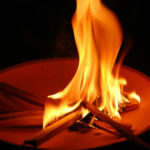 I hope to read from you soon, in spite of noticing that the post is relatively old. My e-mail is twotimesc@gmail.com and the other one is atrox2xc@gmail.com. Thank you Sumo Joe. True, some tattoos are just amazing and I have a respect to those tattoo artist. I would say it´s an art despite of social view towards them. I understand the situation of your daughter. For westerners it´s a part of fashion but the case of Japan is more conceptual. I mean why they needed to have it or how painful the process went depending on the size of the tattoo. I was once thought of having one but now I think it was better that I didn´t get it. While this is simply anecdotal, it is clear that Japan is far ahead the US and the UK in the understanding of different culture. Thank you for a wonderful article as i did not know about the tattooing criminals. I know there was a time where government employee’s were not hire if they had a tattoo, not sure if that is still the case. If one goes to the private onsen’s most times one is ok with a tat. Thank you for your comment. Usually counpanies have company rules and as far as I see, many companies prohibit having tattoos. It depends on the profession you have. School teachers, sports instructors, Sumo wrestlers and public servants are those to begin with. But there are more, it´s totally up to the company policy. It´s not so easy to live with tatto in Japan. 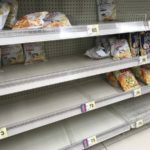 I really appreciated this article as it addressed a concern of mine. 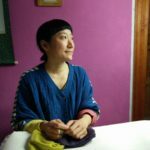 I lived in Japan many years and return on a regular basis often taking friends and family with whom I wish to share my second home as I consider Japan. My beloved niece is one of the tattoo generation (arms, entire back, feet, shoulders) and I worry about the reception she will receive when we go together. She has Japanese friends in Los Angeles who are tattoo artists so she promotes them to me as an example that Japan is becoming more accepting of fashion tattoos. I would be very interested to hear from people who have had recent experiences. I would guess that perhaps in Tokyo it might be less remarked upon, but I usually stay around Kyushu and Kyoto when I am there. I would like to hear of experiences in ‘inaka’ too, for people with tattoos. 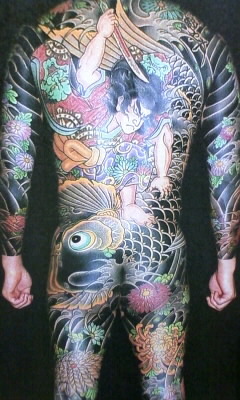 Although Japan has a long history in tattoo, it´s always has been related to some dark part of the society. As far as I know, having tattoo doesn´t give a good impression to Japanese people so much. But I´m talking about between Japanese and I can´t tell you if it´s the same when foreigners have it. They may consider as a fashion and don´t mind it, then when it comes to public space such as Onsen or swimming pool, I assume that they wouldn´t change the rule. 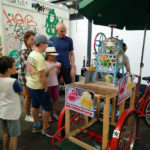 We need more opinion from Japanese people and perhaps you can explain to your niece the situation in Japan, in case she didn´t know and doesn´t get disappointed with certain things.